(Waldorf, MD., Aug. 8, 2018) - The Southern Maryland Blue Crabs (9-17) dropped both games of a doubleheader against the Sugar Land Skeeters (19-9), 12-2 in game one and 7-0 in game two. The Blue Crabs got the scoring on the night started in the second inning of game one, putting up one run off Yasutomo Kubo (2-0). After Kubo retired the first four batters he faced, Frank Martinez broke the streak with a single. A groundout moved Martinez up to second, allowing him to score on a two-out hit from Cory Vaughn and give Brett Marshall (4-8) an early 1-0 lead. The lead didn’t last long, as Sugar Land batted around to put up seven runs in the third inning. A single, an error, and a walk loaded the bases in the inning with still nobody out for Anthony Giansanti. Giansanti singled to score a pair of runs, with a Derek Norris single adding a third run. A flyball put an out on the board, before a wild pitch and single from Matt Chavez brought home Giantsanti and Norris. Back-to-back singles would score Chavez to add another, before a pickoff at third put up the second out in the frame. A walk and a single loaded the bases once again, before Marshall hit Barrett Barnes to score the final run in the inning and put the Skeeters ahead 7-1. 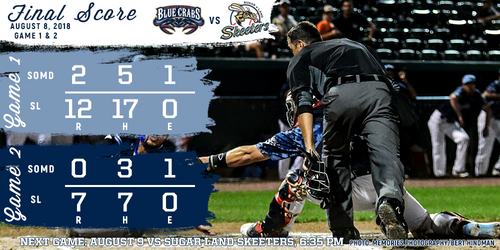 After a scoreless fourth, Sugar Land put up three more off the Blue Crabs bullpen in the fifth inning. A strikeout started the inning, but a walk put Denis Phipps aboard. After another strikeout, a single from Barnes extended the inning for Giansanti. The utilityman came through again, this time with a double that scored Phipps easily. Norris followed that with a two-RBI single, pushing the lead out to 10-1. The offense wasn’t quite finished in game one, as the Skeeters added a pair of solo homeruns from Barnes and Norris in the top of the seventh. Vaughn would add a solo homerun for Southern Maryland in the bottom of the seventh, but Mark Haynes was able to finish off the 12-2 win in game one for Sugar Land. After a 35-minute break in between games, both teams took the field for game two of the doubleheader. Barnes wasted no time putting Sugar Land on top in the game, launching the second pitch of the game over the left field wall for his second solo homerun of the night. Giansanti followed that up with a single, moving up to second on a groundout to the pitcher. Courtney Hawkins would single two batters later, bringing home Giansanti to grab a 2-0 lead. Albert Cordero would lead off the following inning with a single, moving into scoring position on a walk issued by Craig Stem (5-5). A sacrifice bunt would move both Cordero and Phipps up 90 feet, setting up a sacrifice fly from Barnes to add another run to the lead. After a pair of quiet innings in the third and fourth, Sugar Land would add two more to their total in the fifth. A groundout and a popout began the inning, before Giansanti and Norris would go back-to-back with solo shots. The two homeruns were the fourth and fifth for Sugar Land on the game and gave them a comfortable 5-0 lead. The Skeeters featured a number of contributors on the mound in game two, as Kraig Sitton got the start in the game. The southpaw went two innings, retiring all six batters he faced before he was removed from the game. Four relievers combined to allow just three hits over the next four innings. Giansanti would add a second homerun to his total in the game, a two-run shot the put the lead at 7-0. Felipe Paulino, the closer for Sugar Land, would take the mound for the bottom of the seventh in the game. The right-hander worked a 1-2-3 inning to finish off the night, giving Sugar Land the 7-0 shutout victory. The Blue Crabs return to action Thursday, August 9th for the series finale against the Skeeters. First pitch is scheduled for 6:35 P.M. on Thursday at Regency Furniture Stadium. For more information on the Southern Maryland Blue Crabs, or to reserve your seat today for any of the Blue Crabs upcoming home games, please visit our website atsomdbluecrabs.com or call us at 301-638-9788.